As it was seasonally appropriate, so many of my preschools and centers requested a “spring” theme. Needless to say, while this is a great storytime plan that worked well for every group that I visited, I’m very glad to put it away for the year. At this preschool, I presented in one of the larger classrooms and different groups rotated to storytime. This preschool was enamored with Wow! Said the Owl and did the best job of remembering our secret code to say “WOW!” together. (I wave my hand at the group instead of pointing.) As always, Butterfly, Butterfly is a sure-fire win due to the pop-up page at the end. And it worked so well with our ASL sign! My friends at this school remained in their classrooms and I traveled. Since it was only two storytimes and their classrooms were right next to each other, it worked out. This group really responded to the planting element of spring. Their favorite activities were definitely the “Planting a Rainbow” flannelboard and the folder story. I really appreciated the teachers in this group because they carefully wrote down each book and I could tell that they were just as engaged in the storytime as the kids were. I had a lot of fabulous surprises at this preschool — mostly especially the “thank-you” notes that were given to me as each set of classrooms came for their storytime. I had a child notice the endpapers of Splish, Splash Ducky which led to a great conversation about authors and illustrators and why that book had a picture of a person on the inside cover. My friend asked me after every book if there were any more author/illustrator pictures and we checked every time. These groups *loved* singing “Five Little Ducks” with the flannelboard, as well as the “Flutter, Flutter Butterfly” puppet and rhyme. I extend this song now to other silly actions (jumping, spinning, hiding) and the kids love when the butterfly peeks out from behind me during the hiding verse. During the summer, I visit several area preschools to do storytime. They all request specific themes, relevant to their curriculum. At this school, I visit a total of six classrooms. Each classroom doubles up with another group creating three storytimes at the visit. I’ll star the materials each time I use it. This week’s theme was the ocean. This was a fun set of storytimes. All three groups really enjoyed the theme, particularly the extension activities. The older group got to hear Surprising Sharks because their teacher requested some easy non-fiction, preferrably about sharks. I was happy to oblige with this Monarch nominee from a couple of years ago. I think the kids enjoyed I’m the Biggest Thing in the Ocean the most out of any of the books. During the summer, I visit several area preschools to do storytime. They all request specific themes, relevant to their curriculum. At this school, I visit a total of six classrooms. Each classroom doubles up with another group creating three storytimes at the visit. I’ll star the materials each time I use it. This week’s theme was Epic Explorers. This theme ABSOLUTELY stumped me until I reached out to my librarian cohort and got suggestions for It’s a Tiger, Row, Row, Row Your Boat, Shark in the Park!, and “We’re Going on a Bear Hunt”. So the moral of the story is you’re never too experienced to stop and ask for help! All three of these storytimes were great. I was able to share many of the books across the three different age groups. Their favorite books were Shark in the Park! and It’s a Tiger!. During the summer, I visit several area preschools to do storytime. They all request specific themes, relevant to their curriculum. At this school, I visit a total of six classrooms. Each classroom doubles up with another group creating three storytimes at the visit. I’ll star the materials each time I use it. This week’s theme was inventions. Normally, I’m able to use many of the same books over and over, but not with this theme. I basically created three separate storytimes. Now there’s just four nails left to pound. Books: Meeow and the Blue Table, Not a Box!, Tip Tip Dig Dig. Books: Going Places, The Most Magnificent Thing, and Rosie Revere, Engineer. I would normally do four books with preschool, but Rosie is such a long story that I stuck to three! This group really benefited from my Monarch reading. Two of the titles are current 2017 Monarch Award nominees! This group LOVED “Five Little Nails”! 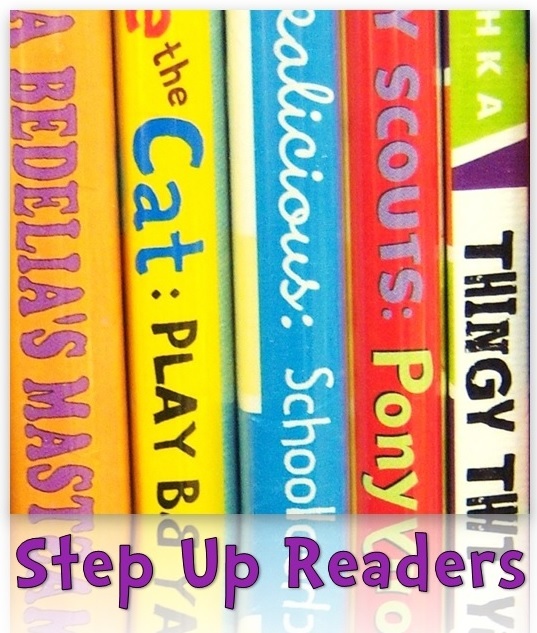 Books: Hoop Genius, Imaginative Inventions, Rosie Revere, Engineer. I really feel like the School-Age group got the best books. Hoop Genius is another Monarch book and tells the story of how basketball was invented. They were so excited about this book. I have a lot of boys in the school-age group and I could just see their engagement during this whole text. I read out the index (which let me do a little information literacy about how books are organized!!) of Imaginative Inventions and had the kids pick some of the inventions that interested them most. What a fabulous storytime! During the summer, I visit several area preschools to do storytime. They all request specific themes, relevant to their curriculum. At this school, I visit a total of six classrooms. Each classroom doubles up with another group creating three storytimes at the visit. I’ll star the materials each time I use it. This week’s theme was Eric Carle. First of all, Eric Carle’s books are SO interactive that I barely felt the need to do any extensions activities. We made animal noises during The Very Busy Spider, acted like zoo animals during From Head to Toe and 1, 2, 3 to the Zoo, made our moons bigger and smaller during Papa, Please Get the Moon for Me, pretended to painted during The Artist Who Painted a Blue Horse and joined in on the refrain during nearly all of the books. The toddler rooms really enjoyed The Very Busy Spider and making animals noises. That was definitely their high point. The pre-k rooms were spell-bound by the flaps in Papa, Please Get the Moon for Me and also enthusiastically participated in From Head to Toe. The preschool rooms were my loudest chanters during the “Brown Bear, Brown Bear” flannelboard and really enjoyed all the books. I was able to read FIVE BOOKS with them because of Carle’s shorter texts and their incredible attention. During the summer, I visit several area preschools to do storytime. They all request specific themes, relevant to their curriculum. At this school, I visit a total of six classrooms. Each classroom doubles up with another group creating three storytimes at the visit. I’ll star the materials each time I use it. This week’s theme was Road Trip USA. And then we’ll make it stop! This wasn’t the easier storytime theme to find appropriate books for — let me tell you that! I wound up having a good mix of younger titles (Who Is Driving?, Red, White, and Boom), all ages titles (Wow, America! ), and older titles. A couple of quick notes: I paperclipped one spread in Tulip Sees America because the main character takes his clothes off (nothing showing). And I also didn’t read all of Go, Go, America. I read the pages that introduce the Farley family and then read the Illinois facts that were easy for preschoolers to understand. For my oldest group, I flipped to another couple of states and read a few more facts for them. My favorite book was definitely Wow, America! because it was perfect for all ages. In my toddler classrooms, we just marveled at the cool things in America. In my preschool and pre-k classrooms, we had great discussions about the monuments and landmarks. I had a couple of friends who were AMAZING in their US knowledge. One pointed out that the Statue of Liberty was “a gift” and another pointed out that “[the White House] had burned down once”. I was really impressed.